Many people will agree when I say that Brazilian Jiu-jitsu makes you totaly become addicted to it. Once you get caught up in it, trainings will quickly give your daily life its tempo and hold an important place. I always have been aware of that but only get the scope as I had to stop to train. A few months ago I ended up at the casuality department because of an herniated disc. Nothing too serious (It’s just a “small” one but I don’t want to know what a big one is!) but I got the verdict : no more jiu-jitsu this season. I never did a long break so it was a small hammer blow for me. So I watched many Brazilian jiu-jitsu videos to pass the time. I was happy because I finally took time to find new techniques. I saved those I want to work on later and created my “to do list”… Until I became aware that I saved about ten videos in just a few days! At the time I thought I have to slow down the rythm…. Physiotherapy is discipline (and make up for the gap left by the training in my schedule). Despite everything I felt the call of the mat. As soon as possible I went to the academy to watch the training (but I left the gi in the wardrobe: rule n°4!). I found the atmosphere again, my friends… As strange as it might seem I even missed the smell of the dojo (at that point I started to ask myself questions…). I spent many weeks watching the training, keeping in mind that Helio Gracie learned jiu-jitsu by watching his brothers train. Following the class, watching the other work on techniques and rolling are ways to maintain a foot on the mat. A substitue that makes you feel better but I stilll had pins and needles in my hands because I wanted to hold a Gi or step on the mat. When you move from several trainings per week to none you also start to get quite desperate. So in addition to the injury, a feeling of physical and moral unease appears. I was as limp as a rag, unfit, highly sensitive (I felt a bit sorry for my colleagues…). The first reeducation exercices sounded like a relief (I know I really look like an addict). To optimize it I put money into a gym ball to partially replace my office chair (its quite uncommon in France, people find it funny and talk about me). So I improve my posture (well if I have a bad one I fall down) and do soft lumbar strenght exercices. In addition I also do daily exercices from the McKenzie therapy (3 times/day). This method puts pressure on the nucleus pulposus (core of the disc) to put it back into the disc (I won’t go into details ; you will find more information on the McKenzie Institut’s website). Between the ball and my gym I looked like an oddball at work! The doctor advised me to do sport again starting with a soft activity and suggested to go swimming or riding. I had the choice between a sport that bore me and that I found unconfortable, and swimming which I haven’t practised for 10 years because I was traumatized by the sport exam of my high school degree. I chose swimming because it needs less equipment and above all with the number of swimming pools around my home, I have no excuse to get around it. A good choice for me: I get reconcilied with this sport (no, its not because of the lifeguards…), complete my lumbar strenght exercises and improove my cardio. 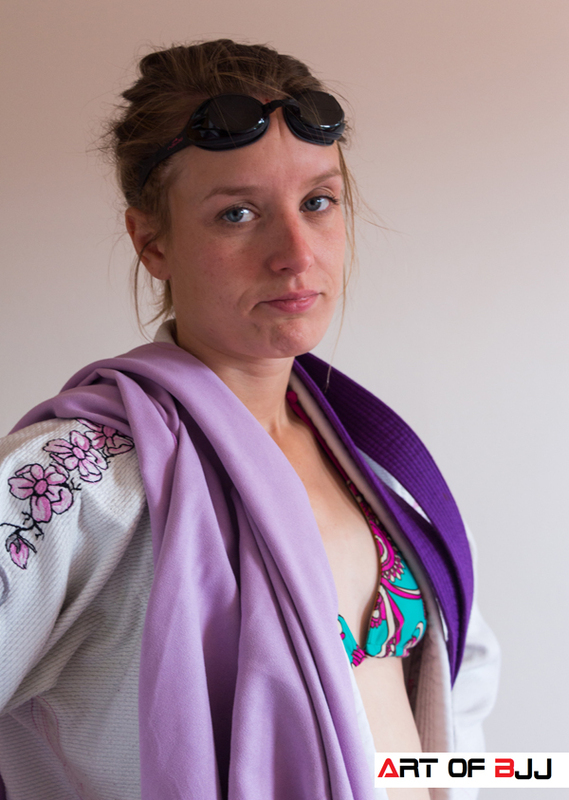 Furthermore I managed to convince some of my BJJ friends to go swimming with me! I have no more excuses. I manage to counterbalance but the desperation is still here. When you cannot practise it you find yourself thinking about jiu-jitsu in unexpected situations. A friend who’s also injured told me he used to drill on pillows. While I was sitting on the floor at a concert I surprised myself imagining how to attack the person standing next to me…There’s no doubt about it: I live, I breathe, I think BJJ. Finally there’s no miracle recipe to conterbalance the not being able to do Brazilian jiu-jitsu. Listening to my body and patience (rule n°4) are for me the pillars all along my convalescence. And you, how did you deal with your injuries?